I stood along the third base side at Citi Field wearing my David Wright jersey on the last day of the 2018 season. I was there to both cheer on the Mets and honor my dad, who passed away in early September. I brought three orchids to represent each of his daughters and asked security after the game if I could leave them on the field. I had shared about my dad’s love of the Mets and his recent passing. Security allowed me to place the flowers on the field along the third base side. I released each flower with love and gratitude to my dad – a life-long Mets fan. It was a beautiful tribute and I cried the whole time. When tickets came on sale for the 2019 season, I had to buy Opening Day tickets. I had to keep the Mets baseball traditions and memories alive. One of the rituals I had with my dad was talking about the Mets rosters, line-ups, and who we would have starting each game. So as April 4th rolled around, I could feel both the joy and sadness rise up in me. I felt the longing of missing my Mets conversations with my dad and the joy of cheering along with the sold-out crowd. Inside the stadium, I took in the familiar views and sounds of Citi Field. I walked along the Field Level and saw Mr. Met. There was an area that fans could go to take pictures with him. I stood on line thinking it would be a cute photo to share. 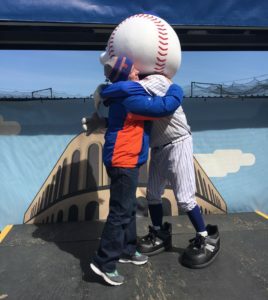 When my turn came, Mr. Met looked at me, opened his arms and gave me a big hug. I felt my dad was saying, “I’m here. Welcome home.” We stood together taking numerous photos.